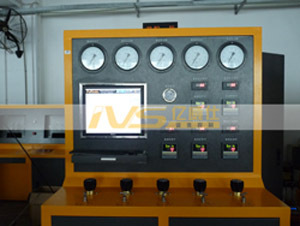 Gas Lift Valves Test System is designed for carrying out the functions of gas filling, calibrating, pressure testing and performance testing on gas lift valves. Not only can ensure the safe and efficient downhole operation, but help to improve and develop gas lift tools through providing comprehensive test data. Pressure measuring accuracy: ±0.1% F.S. Pressure control precision: ±0.5% F.S *(or on request) . Pressure measuring accuracy: ±0.05% F.S. Pressure control precision: ±0.1% F.S *(or on request). Temperature range: Room Temp.~ 150℃ *(or on request) . Pressure control precision: ±1% F.S *(or on request). Test pieces: 20pcs at one time. Pressure measuring: measuring range: 0~35MPa, accuracy: 0.1%. Position measuring of valve rod: automatic control via servo motor. Micro-distance measuring: measurement range: 0~10mm, tolerance: ±0.127mm. Pressure measuring: measurement range: 0~15MPa, tolerance: 0.5%. Flow rate measuring: measurement range: 0~50000Nm3/d, tolerance: 1.5% . 1.Comprehensive performance testing: to simulate the working status of downhole operation of gas lift valves; and improve valve’s design accuracy via providing reference data. 2.Capable of carrying out both flow coefficient testing and dynamic performance testing..
3.Automatic test & calibrating controlled by PC+PLC. Manual operation is on standby (pushbuttons). 4.High speed data acquisition support real-time display of pressure-time curves, etc. 5.Test results saved automatically and allowed to print out for a further analysis. 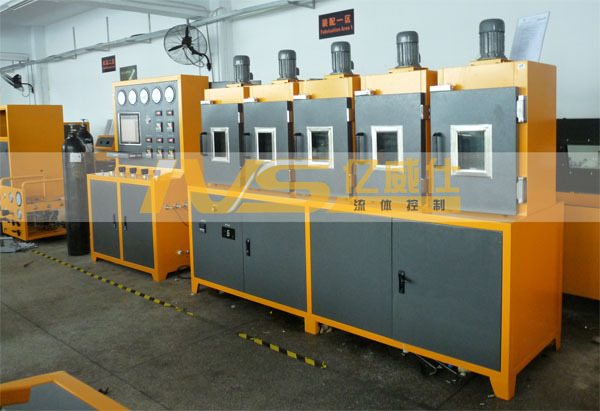 6.Comprehensive monitoring to being tested specimen and whole testing process can be recorded in DVR. 7.All key materials like gas boosters, high pressure valves, tubing and fittings are made in USA.